There are many types of crystals: natural crystal from earth, fallen stones from sky, laboratory grown crystal and leaded glass. Natural crystals which crystallized from pressure and heat of natural forces may have inclusions (foreign material), is normally unclear and have natural cracks in them. Another type of natural crystal is fallen from the sky and had travelled through heat from a long distance to form stones. On the other hand, laboratory grown crystals are being developed through a process known as crystalization and dyed to perfection with less or no cracks and the colors are more evenly distributed. Meanwhile, the leaded glass crystal contains lead to enhance the shiningness and reflective qualities of glass. Natural crystals are crystallization of minerals that were created by heat and pressure for a long period of time. They crystallize in layers and then turned into a more structured shape and size. This formation requires large amounts of energy and it is during this period of time that the crystal accumulate the energy. And it is this energy that brings life to the crystals. All natural crystals and gemstones "vibrate" with their own individual frequency. Science has proven that crystals possess a natural power called the piezoelectric effect. This means they have the ability to amplify, channel or flow like electricity. Natural crystals grown from earth has powerful and strong earth energy and are potent energizers for earth element. The energy emanating out of the crystals is clear and integrates with human aura, this being its contribution to feng shui. Ammonite is believed by Feng Shui masters to be associated to the scales of the mythical creature "Chi Lin" because the colors and patterns on it are the same as scales of Chi Lin. Therefore the stone brings riches, wisdom and illustrious sons, similar to the potency of the Chi Lin. Some natural crystals are originated from fauna and flora, such as coral, amber and pearls. In recent years, feng shui experts had discovered that the ammonite (said to be 70 million years old) is a powerful wealth stone. Ammonite was found in recent years, after many years of search for it. People in Hong Kong and many parts of the world believe that the ammonite possesses energy for generating good luck. Another natural precious stone worth mentioning is the tektite meteorite, a god-made stone that is extremely popular and seeked after. Tektite is not a crystal or stone that grow on earth. Instead it is the ONLY stone genuinely fallen from the sky through outer space, being the reason why it is the only stone genuinely believed to be fallen from the heaven. A tektite is actually a meteorite that falls onto earth, only found in Tibet, Australia and USA. The Tibetan tektite is the most powerful. Some scientists believe they belong to material found in the moon due to geochemical evidences. Because it is a meteor, it has powerful energies and strengthens energy field within us and in our surrounding. 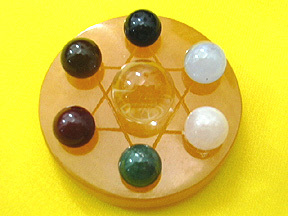 It is best to benefit those who desire to balance and activate the whole chakra system for all-rounders luck. It is known to have the best effect to ward off evil spirits and bad luck. Its black color is best to represent water element, therefore benefits wealth and career luck! All natural crystals store energy. The kind of energy depends on the composition of the mineral, the structure of the crystal and its color. There is great importance to the color of the crystal. All crystals of the same color are connected to the same part of the body and to the same emotional and mental needs. The difference between crystals of the same color is due to their mineral composition. Natural Citrine Chips possess natural power that activates money luck, wealth and abundance. On the other hand, laboratory grown crystals have the amplifying and storage properties of natural crystal, but considerably cheaper. Because synthetic crystals are man-made, the crystalline structure is perfect and they have distinctive vibration qualities that differ from natural crystals. Laboratory grown crystals have amplifying and storage properties of natural crystal. Meanwhile leaded glass crystals are made from glass, carbon, boron and germanium which could change the color of the end-product. They possess a great deal of sparkle and are used to diffuse light over a wide area. They are usually made rounded, faceted or shaped into auspicious designed that could be used in feng shui to transmute energy. When shar chi enters faceted crystals, the facets deflect the energy and turn it into positive forces (sheng chi). A perfect man-made leaded glass crystal lotus is able to transmute vital energy to enhance and purify your space to create love, friendship, wealth luck and career enhancement. Hence, crystals can clarify thoughts, channel energy, increase creativity and rectify emotional balance. They can also be used to realign the chakra centers (our energy points). 7-Chakras Bracelet will align all our chakras to create energy balance so that we can enjoy ultimate feng shui. The word "chakra" is derived from the Sanskrit word meaning "wheel". If chakras were tangible, you would see wheels of energy that continuously revolve and rotate. There are seven major chakras, each rotating at different speeds. Illnesses or emotional imbalances can occur because they move out of alignment or there are blockages which restrict the free flow of the body's energy. Crystal healing is aimed at realigning these chakras. Star of David is engraved on a Yellow Jasper circular base. The sacred star connects the seven chakra spheres together so that they can interact with each other to generate powerful energy. Best for those seeking to nourish all their 7 chakras and balance 5 Elements in living space for perfect feng shui. So, how would you know which crystal to choose? The easiest way is by colour. Each chakra has an associated color (or colors) that can be matched to crystals or minerals which affect various areas of the body. Other way of choosing a crystal is easy. You may be attacted to a crystal because of its color, its form, the feeling it may give you or anything else that makes that stone special in your eyes. Normally this is associated to your personal element from your Bazi. If one is lacking in certain element, they have a special instinct for that particular color. Choose the crystal by your own feeling - the intuitive impression is most important.Some people keep the same stone, while others change the stones according to the needs or desires of each day (examinations, important meetings, court cases, pain etc) or according to intuition. Once you have picked your crystal, you need to "programme" it with your thoughts. This is a way of personalising and creating a new energy or bond between you and your crystal. Choose a crystal based on your intuition. Or change stones according to your needs each day (friendship, business meetings, examination etc). But before you start using crystal, the first step is to cleanse it. This can be done through several methods. Some may recommend salt water cleansing, while others use pure water soaking followed by exposure to sun. Others may recommend flushing crystals with running water. But the most effective way practiced by Asian crystal stores and Feng Shui Bestbuy is cleansing them using the chi-refreshing "singing bowl". Then the next step is the process of harmonizing and integrating the changes into your whole being. We must be conscious of this when we work with one or several crystals for healing purposes. Take some time off each day to fine tune our thought patterns through breathing exercises and visualisation with crystals. One will obtain great power from doing so. The crystal will undergo tremendous adjustments to your energy field, matching it with a larger outer universal energy field. The vibrations will continue to affect areas of imbalance, restoring a positive state in its place. You may notice physical, mental, emotional and spiritual bodies come into alignment. Your face looks more relaxed and your mental feelings may change significantly. All aspects of your energy will be activated and will result in positive feeling. Placing crystals in the home, in the office or in any place one spends time, may provide the atmosphere of peace and harmony. Many have found that the presence of crystals in their home changed the whole energy of the house. Couples become more loving, children study harder and income increasing from time to time. Displaying six smooth crystal balls in the center of your living room smoothens the flow of energy, ensuring purification and everything goes smoothly in your life. Some prefer eight crystal spheres to enhance wealth, friendship and networking. Many businesses keep citrine clusters to improve their income. Bachelors would choose rose quartz, while family devoted people would choose amethyst to improve all areas of their lives. Rose Quartz Mandarin Ducks promises love enhancement. Today, most crystals are carved for feng shui use in the form of spheres. Solid crystal spheres are highly prized because of the powerful earth element at its most perfect and most pure. The circular shape represents completeness and an infinity of space. Together, they symbolize the realization of all possibilities. They have been acknowledged by many old feng shui masters as creating a broad spectrum of good fortune vibrations. 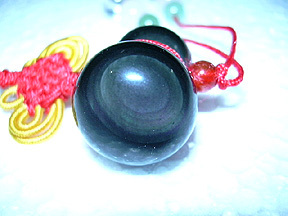 Mystical Knot is the most powerful fortune enhancer in Period 8 (carved in jade). 5 Bats Longevity Symbol becomes strengthen in power when carved out of brown jade gemstone. Many feng shui symbols had also been married together with crystals to amplify the potent effects. Skillful craftsmen had carved the calabash, the period 8's fortune mystical knot, feng shui celestial animals and statues of wealth gods out of genuine crystals. Feng Shui symbols crafted out of crystals are undisputedly very auspicious and exerts powerful forces to deflect illness, evil and bad luck. Certain crystals such as the Rainbow Obsidian may have the highly prized "third eye" which could help you see the unforeseen and deflect evil spirits. When crafted as a wulou the intrinsic properties are being amplified further. There are many colors of aventurine. But green aventurine is particularly more popular. It brings education luck, prosperity and abundance. It is also a good energizer to nurture self-potential in studies, doing business, sales, career advancement and whatever project that that needs success. It promotes inner growth, personal development and self-initiative. Best for those sitting for examinations. Red agate is worn by ladies to improve marital fidelity and chances of pregnancy. Agate also comes in a many colors. But the particularly popular one is the red agate. Orange and red is associated to our two important chakras: the root and sexual center chakras. Thus, red agate could emit energy that is potent to nourish these two chakras. It helps to replenish fatigue, increase energy and improve blood circulation. For married ladies, it also helps to increase marital fidelity. For men, it is used to cure impotence and increase sexual desires. Amethyst has very strong energy and this can be easily felt. It purifies and transmutes all forms of negativity. It carries both healing and enhancing properties. It provides protection and balance during transition periods. It gives a spiritual perspective on life's circumstances. One usually connects it to the heart chakra, easing a betrayed heart and healing the sense of loss of life and innocence. Amethyst helps you think and act at your highest level and increases wisdom. This is the wealth stone for feng shui practitioners. It is expensive due to high demand. Many people receive windfall, upsurge in finance and improved income after wearing or displaying the citrine. It encourages a bright outlook and happiness. It attracts wealth and joy. On health side, citrine is said to improve stress-related digestive problems. They can be used to activate wealth and money luck. Clear Quartz Some people thought this is frozen from water. It increases mental clarity and foster creativity. Giving a calm and soothing effect, it awakens spiritual insight and vision and a great tool for meditation and visualization processes. Diamond The most expensive stone of all is the diamond. It is precious and can be bartered from riches. It intensifies and activates one's internal energies through its pure vibration. Hematite which has the same family as magnetite comes from ferum. They possess magnetic effect. It is used to enhance logic thinking, mathematical ability, rational thinking and depth of technical knowledge. It generates creative energy, making thoughts practical and focused. Known as the "dream stone", it enables learning through dreams, encourages physical understanding of dreams. It beams love, courage, chastity, justice and wisdom. Reduces negativity. Imparts a sense of self-worth, self sufficiency and confidence in facing any situation. It promotes harmony, balance, and tranquility. It is excellent for recovery after an unpleasant experience (minor surgery, divorce, funerals, loss of job). Soothes the emotion, and restores balance after various traumas. Increases ability of expression. Balances the heart emotionally. Heals, purifies and provides comforting energy. Provides endurance and peacefulness when worn. Calms and may bring one to a level where the body may heal itself. Increases flexibility. On the medical side, it strengthens the heart, the kidneys and the immune system. May heal the eyes and help deal with mental problems. Helps purify blood and encourages a long life. Yellow jasper is a stone like jade. It is known also as the wealth stone due to its color. Many ornaments have been recently carved out from this stone to attain wealth luck. Very soft in nature, it can carve out practically any figurine that one desire. It calms aggressive energy, and protects during mental recovery periods. Lapis Lazuli Dugged from deep inside the earth, it possesses a lot of earth energy. Normally blue in color, it is particular great to represent water element. For benefits, it stimulates mental strength and intellectual precision. It intensifies psychic power among the intuitive. Moonstone Moonstone is a very expensive stone and comes in various colors. It is made into very beautiful jewellery range most of the time. Women like it because it can rejuvenate the skin and hair and reducing water retention. On top of that, it provides protection for travellers. Transmutes emotional negativity at all levels. It harmonizes and balances energy fluctuations. It is excellent for calming the Heart and Solar Plexus chakras after situations involving emotional upheaval, chaos, trauma or crisis. Rose Quartz allows love to come to those who have trouble finding love within themselves to share with either themselves or others. Enhances one's ability to give and receive love, mellows out a reluctant heart, and provides peace in relationships through harmony. Unblocks anxiety and promotes healing of private emotional issues. Clears and transmutes negative emotions. This crystal stablizes mood swings and grounds all kinds of negative energy. They help to clarify thoughts and get rid of bad dreams. Is excellent for mood swings, aggression, ill temper and nasty thoughts. It counters burnout, fear of failure, or vengeful thoughts, as well as the tendency to over-eat, smoke or drink as a reaction to stress. Sodalite comes from the word soda. It has patches of white soda in the stone. It helps alleviate insomnia caused by overactive mental chatter. It dispels irrelevant thoughts, provides mental focus, and maintains logical reasoning with regard to emotional situations. It promotes trust, enhances companionship and is excellent for busy women, who need to restore mental energy. It is the best form of water element representer due to its blue color.